Multi-function tools use an oscillating action to carry out a large variety of smaller scale, detailed functions including routing, sawing, sanding, scraping, cutting etc. The materials the various accessories can be used on include copper pipes, plastic, dry walls, wood, stone, paint, grout removal, tile adhesive, window putty, caulking etc. Great robust and versatile product, blade changes are simple, even whilst wearing gloves. Speed adjustable through the trigger. A tool for all trades. had this for a few years now never let me down and its taken a battering. Can fit 3rd party blades onto it. Solid build quite noisy but that's to be expected. Get it from the right place (online only stores) and you can bag this at an incredible price. I got the whole kit with sander attachments and all blades etc! It has been an immense must have in many situations from getting through mortar to remove bricks and literally cutting shapes out of blocks like its wet clay. (with the right blade - the mortar buster, which is expensive and blunts after 3 heavy uses.. but is a brilliant blade) I take it to most jobs. And it has replaced my jigsaw on many occasions... (again with the right wide blade.) grout removal is a cinch now. It has not jammed or stopped on me yet. Amazing tool!! Good bit of kit! I’ve got a makita 18v multi tool as my kit is all makita but when working along side my mate he has the dewalt kit so I’ve used this a few times now, power wise it has a bit more than my makita, although it can vibrate quite a bit when on high setting, the quick release blade change is good, and it is pretty well made, bit on the pricey side on its own. Got two of these now don’t know why ( just greedy I suppose) good bit of kit , value for money Easy to change blades. Absolutely brilliant piece of kit, the quick change multi tool feature makes switching blades out as simple task, unlike the cheaper multi tools I have used in the past. This is my go to tool, helps me out so much, would lose loads of hours if it wasn’t for my multi tool. Where would I be without my multitool! I reckon I must use it on most jobs and it's got me out of bother loads of times. I'm a bit of a dewalt fan but it's definitely well made and shows no signs of slowing down. Plenty of power but I would recommend using other brands of blade as the dewalt ones are expensive and they don't last any longer. Easily one of the best tools I've purchased, easy to use and has an led light when in use. Star lock system means blade changes are quick and efficient. Definitely one of the best and most used bits of kit in my van, much better than the Milwaukee imo. Reasonable price, good build quality as I’ve dropped mine a few time and not too expensive for body only. So easy to use. I don’t know how I coped without one as it’s now one of my most used tools. I like the varible trigger and the quick release blade system. Great value for money too. Ive had my multitool for 8 monthes and i use it pretty much everyday for trimming door frames to cutting socket holes in plasterboard. I like the varible trigger and the quick release blade system. It now lives in my main tool box. Best tool I’ve ever bought, great for cutting out dry line boxes, good value for money. Comes with loads of attachments, would 100% recommend it. I bought this after my cheap multi tool broke, it's an excellent bit of kit. Really easy to use and pretty powerful for the size, it's does use the batteries pretty quick if using for a long time. It's light and easy to manoeuvre in small spaces and the lights a great idea for darker areas. Love this tool, wouldn't be without it. So handy to have. 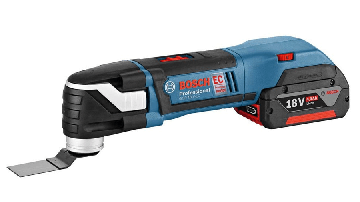 For extended periods of use the 240v is better. Don't know how I've lived without this tool, kept putting off buying one but would be lost without it now! Absolutely love this. Saves loads of time, makes cutting boxes out in plasterboard neat and tidy, and in plaster it saves any little blow outs on the edges if you were to use a pad saw. Definitely a fantastic bit of kit and well worth the investment, at least for a sparky. Amazing tool. Helped me out many times. Great value for money easy to use. Being cordless aswell helps with no restriction of use. Brilliant tool, so useful to have, really easy to use. Being cordless saves time and the batteries charge very quickly. I bought the naked version to add to the other XR tools I already had. Best multi tool Ive used. It has more grunt than the corded versions I'd been using and a nice big trigger button makes it easy to use. Used them all, Bosch, makita, fein and the dewalt packs some real power considering how light and compact it is, Nice and easy to control aswell, unlike others that are way to powerful and leave you with cut marks everywhere other than what you want to cut! Didn't they no there could be much difference between multi tools, had a 240v before and this goes through any material with ease! Best investment I have made! Lovely bit of kit. Handy in so many ways, specially as there are so many attachments. Very good on battery use, I use a 4Ah battery and can get two to three days use from one charge. One fault with it is when your using it for a short period of time a hot spot forms on the back of the handle and becomes irritating to use. Amazing bit of kit. I use this all the time and would recommend it to any tradesman. Always one of the first tools out of the van. It has so many uses, every tradesman should have one of these. 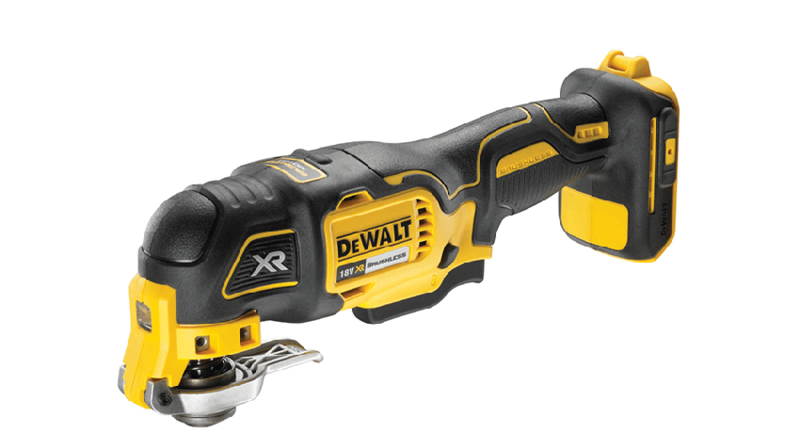 The dewalt model in particular is superb, I had the corded and then swapped to the 18v. There is no noticeable loss of power and the convenience outweighs that in any case. 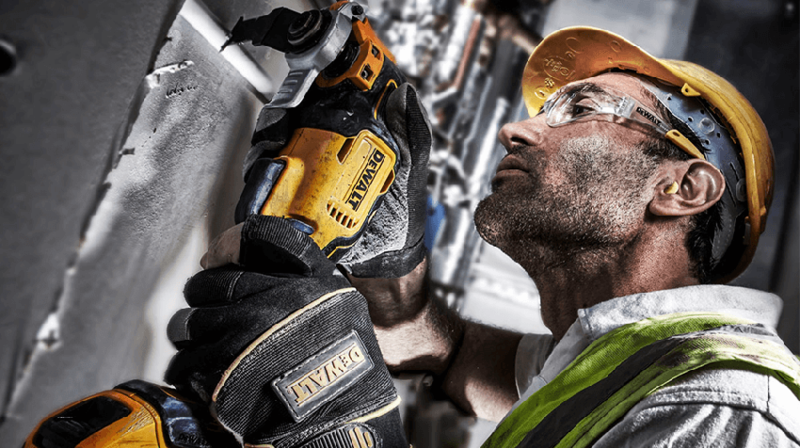 Most models seem to have an on/off switch then a separate wheel to control the speed, the dewalt has a trigger which is far better to use giving you more comfort and control. I have used the Milwaukee, makita, Bosch, and grim offerings and I would put my money on the dewalt. absolutely superb. the quick release blade change is phenomenol!! We got one of these as part of a set from Screwfix. To be honest it stayed in the box for about 6 months before we started using it. We fit doors and windows as well as general building work and now we use it nearly everyday. It's ideal for cutting existing fixings when we remove doors or windows. It's also great for cutting skirting boards without removing them. It's very easy to control and comfortable to use. Battery life is very good. In all you can cut, sand, scrape with it. You'll be amazed how many jobs you can do with it with the range of blades you can buy. Light weight powerful bit of kit with the power of a 110/240v with the ease of battery. Very user friendly powerful yet compact. Hello guys. Welcome to Tool Talk. I'm Ben Curry from Electrical Innovations in Derby. And today I'm going to be talking about one of my favourite new tools. I've had this bad boy for quite some time, it's the DeWalt 18 volt multi tool and it's the brush-less one so it's the newer one. Quite expensive, I think you can get them for less than £200 with a battery, a couple of batteries and charger, around £130 if they're on their own. You tend to normally get them just like this, without the blades but you do get your sanding attachment to it, which you just click on there, put sandpaper on there if you like. So for the longest time I never used this, it just sat in the van never getting much use. And then recently I've started using it more and more, until most recently it's one of the staple tools. Today of all days I went to a job on a fairly new estate, about 30 years old, and was shocked to find straw in the walls. The walls are actually made of straw, unbelievable. Try chasing that out with your SDS with hand-stop on it and a chisel, it doesn't happen. So the blade on the multi tool to cut my boxes out and my chases out, and made sure work of it. I use this thing for all sorts, sanding heads obviously really good, it gets into the corners when you're sanding. We're actually in our new house at the minute, I got the keys on Friday, so I've been painting, decorating, stripping walls, things like that. As you can see the sanding attachment has got some kinda ... these are dirt cheap you buy them in packs from anywhere, cheap as chips. The cutting blades, the first time that you put a cutting blade in one of these you have to get a floorboard out where there's a nail through the bottom of a stud into the floorboard that you're trying to get out from under the stud, and you can do that and push it under and cut the nail, you'll be thankful that you bought one of these. It will have paid for itself in about a second. That's one of the first jobs I did with mine, and it was just life changing, and I've used it ever since. Things like pat sawing ceilings, you know if you had to cut a hole in ceilings to get an arm up for access, pull a cable, cut a nice big neat big hole, just take a whole trap out, dead easy with one of these, leave it for the plasterers they'll be dead thankful that you haven't just smashed it with your hand. Like I've already said, second fixing, chopping boxes in plaster board and walls, cables left in there for you, very useful for that. Yeah spot on one of my favourite tools, and the one I use is the DeWalt DCS355, it's the brush-less 18 volt multi tool, so yeah check it out. Four hour power battery, all the normal things every day when you fire it up it's spot on. Okay this is Tool Talk, I'm Ben Curry thanks for watching. Hi, I'm Russell of Martindale Windows and Developments Limited. I'm a member of Expert Trades and I'm here today to do a review for Tool Talk. Today I'm going to talk to you about the DeWalt Multi Tool, Oscillating Tool, several other names for it I'm sure in the trade. We all have our own nicknames for them. Firstly, to start off with, I'm new to DeWalt as a tool. I'm really warming to it. Firstly for the value, secondly for the quality of the boxes, how tough they are compared to their rivals, the likes of Makita and Festool. Festool were just as good I'd day, but I've yet to find a stacking box that performs as well as that. The clip together system works really well. I've seen some storage solutions for them in vans and workshops, where they all slide into cages and organisation pole systems. They look like they really nailed it on the storage side, so firstly that's really impressive. Second is the price. These are selling at the moment through Screwfix, including VAT at 150. That includes the box, the tool itself and the tool is quick release, which we'll go into in a minute. It comes with two 2 amp batteries, which aren't great batteries, but there are two of them and you can keep them rolling and you can obviously add to your system. They work with all the other tools available, 18 volt this is in particular, brush disk motor, LED light on it, all the batteries have got indicators on them to show you how much power's left. You get a great selection of little tools with it, as opposed to the body only Makita or the other tools like that on the market. The Fein Marter, the original that came out. Price-wise this is, I think, the most competitive tool on the market in its league. We've used it for probably a month now. It's been really good, it's proved really handy. We know that as a tool anyway, purely because of the nature of the tool, great for plumbers, cutting pipes, trimming holes for pipes. The same for electricians, cutting out boxes. We use it for kitchen fitting, cutting holes in work surfaces or in the units themselves. Cutting plastic in the PVC industry, it's really handy for, all sorts. The tool itself, again like I say it's got a quick release, I'm not sure if you can see that there. It's instant between blade changes, batteries connect, this is like a sliding system. Again, two of those in there, 2 amp, with a battery indicator on the back. This one's a little flat, needs charging. Again, you get a charger with it for that price and there's several tools in here, some of which we haven't even looked into yet. That looks like a dust extraction system for it. I think it's a 15 piece set, so you do have several blades in the set with it. These are really handy for raking out grout on tiles. There's some silicon removers, sanding, that's the plate for the sanding. If I was to put that on there for you, you'd be able to see how quick and easy that is to use. There is a lock, like a safety, you can hold it in and it will hold it on there for you, so you don't have to hold the trigger down; just click it to release. For what it is, a very powerful tool, very light, very well balanced. Again, extra sanding pads for it. There are extra ... The connection system, I think there's about eight legs that stick out and they go into the back of the tool itself to lock it into position. There's a spare there if the one you've got gets broken. Alan key to service the tool, you can't fault it really for the level of extras you get with it. Again, there's another tool there, another blade sorry. I'm not entirely sure what this is for. Haven't used it yet, but again I'll get round to reading the instructions on it as we do, after we give it a go first and give up and read the instructions. In it's own league, I'd say one of best tools, best value on the market for what they are and I'll definitely recommend trying it.